Silent film star Anna Q. Nilsson, Photoplay, November 1920. Artwork believed to be that of Rolf Armstrong. 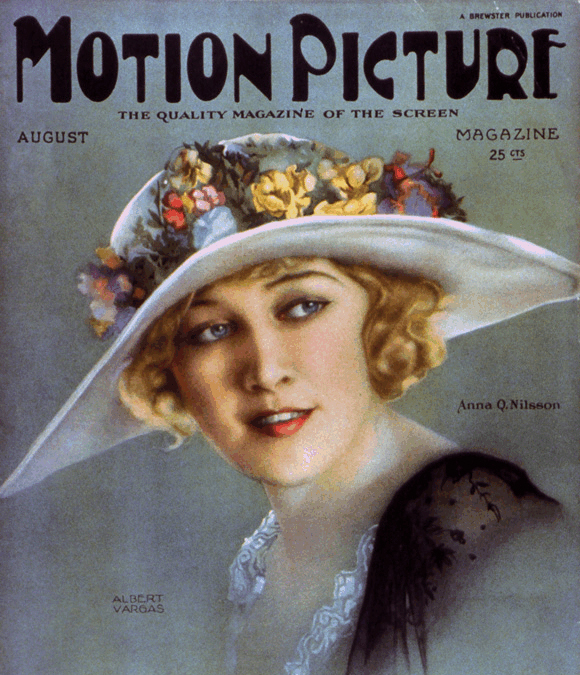 Photoplay magazine was founded in Chicago in 1911. It reached its zenith in the 1920s and 1930s, becoming quite influential in the early film industry. The magazine was renowned for its beautiful cover portraits of film stars by artists such as Rolf Armstrong, Earl Christy, and Charles Sheldon. By 1937, however, with the advancement of color photography, the magazine began using photographs of the stars. 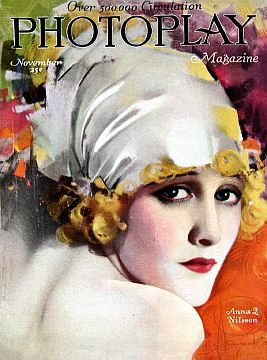 Anna Quirentia Nilsson, shown here on Photoplay’s November 1920 cover, became a star of the silent screen and was the first Swedish-born actress to receive a star on the Hollywood Walk of Fame. Nilsson’s story, however, is quite American in many ways; a story of immigrant dreams, determination, and New York city happenstance. Nilsson’s arrival also came precisely at a time when America’s young film industry was exploding with possibility. Born in Sweden in March 1888, it is believed Nilsson emigrated to the U.S. about 1907. As a teenager in Sweden, she had done a bit of acting, but early on young Anna had set her sights on America as the land of opportunity. Arriving at Ellis Island with thousands of other immigrants, Nilsson found work as nursemaid and learned English. She then began working as a model posing for magazine illustrations and posters. This exposure helped send the 5′-7” Swedish beauty to the emerging film industry. Anna Q. Nilsson, circa 1910s. 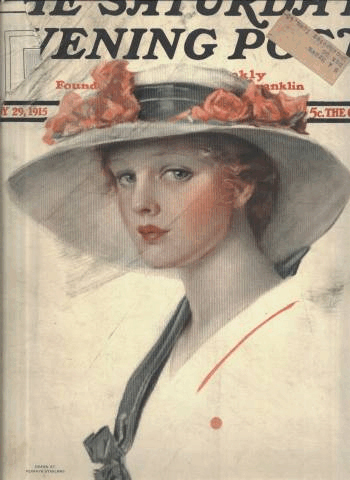 May 1915 Saturday Evening Post cover with model believed to be A. Nilsson. The Saturday Evening Post, Hearst’s, Life, Metro- politan, and others. Stanlaws became one of the most successful and sought after cover artists of his day. And Anna Q. Nilsson became one of his models, in fact, somewhat famously as the “Stanlaws Girl,” rivaling the popular “Gibson Girl” of that era. It was on the basis of these illustrations and her modeling that Nilsson was encouraged to try movie acting. Either through Stanlaws, who became well connected in New York, or others, Nilsson landed her first movie role in 1911, in the film Molly Pitcher, a “two reeler” produced by Kalem Studios. She soon became one of the silent era’s “overnight sensations” and a bonafide film star in the first decade of the 20th century. 1915's 'Regeneration', deemed “culturally significant” by Library of Congress. The early silent films of that era were cranked out at prodigious rate, and Nilsson found her way into a good share of them. She appeared in more than 200 films, about 100 of which were made in the 1910s, including those made by Goldwyn, Paramount (Famous Players), Metro, and First National. At Kalem Studios, she would become the second-ranked actress behind top star Alice Joyce. Nilsson’s movie career flourish through the 1910s and 1920s. 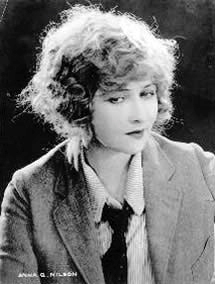 Among the early silent films in which she starred or played a prominent role were: Regeneration(1915), the story of a poor orphan boy who rises to a life of a gangster until he meets Marie ‘Mamie Rose’ Deering, played by Nilsson, for whom he wants to change; Seven Keys To Baldpate (1917), a classic story from Charlie Chan creator Earl Derr Biggers adapted by Broadway legend George M. Cohan who also starred in the film with Nilsson and plays a soon-to-be wed novelist who becomes caught up in a mystery; The Love Burglar (1919),opposite Wallace Reid, in which she helps foil an underworld villain played by Wallace Beery; The Toll Gate (1920), a western co-starring William S. Hart as a former military man who becomes a criminal and gang leader seeking revenge; and The Spoilers (1923), a story set in Nome, Alaska during the 1898 Gold Rush based upon Rex Beach’s 1906 novel. Other films she appeared in included: Soldiers of Fortune (1919), The Luck of the Irish (1920), and The Lotus Eater (1921). In 1923, a banner year, she made a number of films, including: The Isle of Lost Ships, Innocence, Thundering Dawn and Ponjola. In Ponjola — the South African Kaffir word for “whiskey” — the story is about a mining expert who is lost to the bottle. Nilsson plays the woman, who helps with the mining expert’s “regeneration” from alcoholism. list of all Anna Q. Nilsson films; 1920s only. 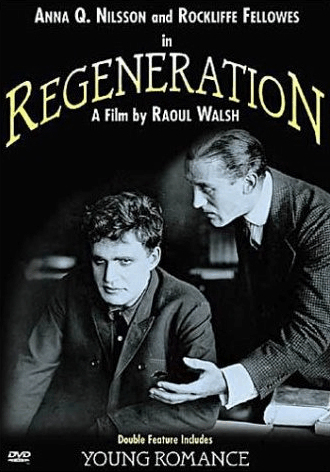 One of the finest films of the pre-1920 era, The Regeneration was the first truly important directorial effort by Raoul Walsh. Spanning several years, this remarkable social document traces the life and times of Irish-American “child of the slums” Owen Conway (Rockliffe Fellowes), who grows up to become a ruthless gangster. Owen’s story is paralleled with that of Mamie Rose (Anna Q. Nilsson), who, though born into luxury, abandons her high-society environs to become a settlement worker in the city’s slum district. When Owen meets Mamie, who takes it upon himself to teach the surly gangster how to read and write, he begins to realize that he has charted the wrong course in life, thereby taking the first tentative step on the road to regeneration. Complicating the story is the fact that Owen’s bitterest enemy, the city’s crusading District Attorney (Carl Harbaugh), is also in love with Mamie. Filmed on location in New York’s Bowery district (just as seedy-looking in 1915 as it is today), The Regeneration boasts thoroughly believable performances and an astonishing variety of fascinating camera angles (including one dizzying shot of a man falling from a fourth-story window). Long available only for archival showings, the film has become a perennial attraction on the Turner Classic Movies cable-TV service. ~ All Movie Guide. 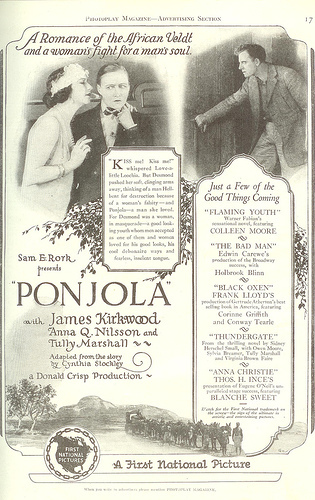 Advertisement in Photoplay magazine for the 1923 movie 'Ponjola' with Anna Q. Nilsson. In 1923, Nilsson also made Hollywood, one of the first film satires of Hollywood life, followed in 1924 by a similar production, Innez of Hollywood, with co-actors Mary Astor and Lewis Stone. In The Splendid Road of 1925, Nilsson is among fortune seekers lured to the California gold fields traveling the long water route around Cape Horn to get there. Once arrived, she encounters Lionel Barrymore, a gambler, and suffers other travails. In another 1923 film, The Talker, Nilsson does some early work on behalf of women’s liberation, in which a woman’s yearning for a career is broached amid old-world family values and the male double standard. In 1925, Nilsson was seriously injured when thrown by a horse onto a stone wall. She suffered a temporary paralysis and spent a year or more in Europe seeking treatment and therapy. Through the latter 1920s, during a determined comeback, Nilsson appeared in a number of silent films, including The Babe Comes Home in 1927, filmed with the actual baseball immortal himself, Babe Ruth. The film was a romantic comedy produced by First National Pictures, which one newspaper report of January 1927 said might net $100,000. Nilsson played Ruth’s love interest in the film. 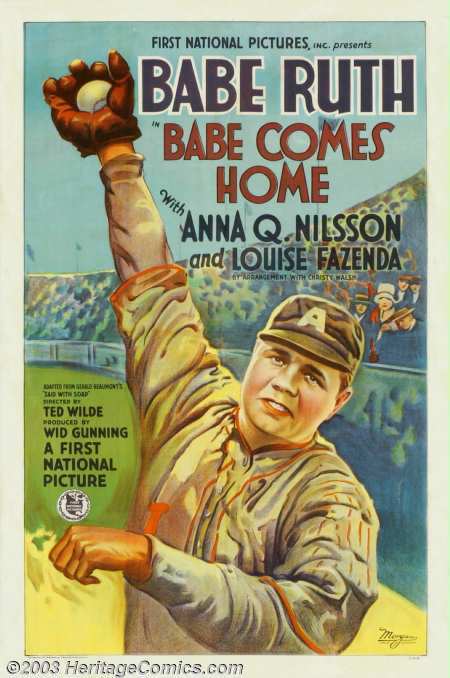 Movie poster for the silent film, Babe Comes Home, co-starring Anna Q. Nilsson and Babe Ruth. This poster sold for $ 138,000 in November 2003 according to Heritage Art Galleries, Arlington, TX. “. . .Babe Ruth plays Babe Dugan, home run whiz of the Los Angeles Angels (a minor-league team in 1927). Babe’s habit of chewing tobacco makes him the bane of the Snow White Laundry, which has to clean his juice-stained uniforms after every game. Laundress Vernie (Anna Q. Nilsson) attends an Angels game to see for herself just how one man can be so messy. Babe hits a fly ball, which hits Vernie in the eye. From this bad start, a romance develops, culminating in an engagement. Based on a magazine story by Wid Gunning, The Babe Comes Home was a success with both movie and baseball fans alike …, but it’s likely that it had no bigger fan than Babe Ruth himself, who later confessed to having sat through the 6-reeler ten times.” ~ All Movie Guide. Anna Q. Nilsson, cover photo, August 1929. In 1928, Anna Nilsson made her last film of the silent era, Blockade. Later that year, she had a second horse-riding accident, this time breaking her hip, but recovering once again and returning to film. In the 1930s, however, as the “talkies” began to take over, Nilsson and other silent stars found it harder to find suitable roles. Still, Nilsson found roles in The World Changes(1933) with Paul Muni, and also in Prison Farm (1938) in which she played a matron. She then retired for a time, but returned to film in the 1940s and 1950s, often playing uncredited and bit roles. During World War II, she joined forces with Bette Davis and Marlene Dietrich to collect money for the American war effort. In her movie career, she had a supporting role in the The Great Man’s Lady (1942) and played Loretta Young’s Swedish immigrant grandmother in the successful The Farmers Daughter (1947). She continued to take smaller parts, some in successful films that showcased other stars, such as Cynthia (1947) featuring then-rising teen star Elizabeth Taylor; George Cukor’s Adam’s Rib (1949) with Spencer Tracy and Katherine Hepburn; An American in Paris (1951) starring Gene Kelly; and 1950’s Sunset Boulevard, in which she and other silent film stars including Gloria Swanson and Buster Keaton, appeared in the film as idolized “waxworks” figures. Nilsson’s last movie appearance was in 1954’s Seven Brides for Seven Brothers. Anna Q. Nilsson died in Hemet, California, February 11, 1974. A few of her film roles survive today on DVD, and at least one, Regeneration (1915), was selected by the Library of Congress in 2000 as “culturally significant” and designated for preservation. Other stories of early film stars at this website that may be of interest include: “A Star is Born, 1910s”(studio creation of early film celebrity); “Pearl White, 1910s-1920s”(history of a silent film star); and, “Talkie Terror, 1920s” (the Hollywood peril of “talking pictures”). Additional stories of similar interest may be found at the “Film & Hollywood” and “Celebrity & Icons” category pages. Thanks for visiting — and if you like what you find here, please consider making a donation to help support this website. Thank you. – Jack Doyle. “Anna Q. Nilsson, Swedish Star In Many Early Films, Dies at 85,” New York Times, Wednesday, February 13, 1974, p. 42. “Biography of Anna Q Nilsson,” Internet Movie Database, Imdb.com. Tammy Stone, “The Silent Collection – Anna Q. Nilsson,” Movie Profiles & Premiums Volume 3, Number 8, March 15, 2005. Press Release, “Babe Ruth Movie Poster Sells for $138,000,” Heritage Art Galleries, Dallas, Texas – November 24, 2003. “Ruth’s Film Venture, ‘Babe Comes Home,’ May Net $100,000,” The Washington Post, Sports Section, January 24, 1927. “New Pictures,” Time, Monday, January 25, 1926. “The New Pictures,” Time, Monday, November 26, 1923.